Revolution Day in Suriname is annually observed on February 25. This holiday was established by President Desi Bouterse to celebrate the military coup in 1980. The Surinamese revolution, also known as the Sergeants' Coup, occurred on February 25, 1980. 16 sergeants led by Desi Bouterse overthrew the government with violent coup d'état. Bouterse created National Military Council, that replaced the government, and became an official head of the state. His dictatorship featured curfew, ban on political parties, lack of freedom of press, restriction of the freedom of assembly, governmental corruption and the summary executions. 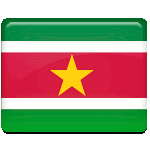 In 1991 elections returned to Suriname, and Ronand Venetiaan (opponent of Bouterse) became the president of the country. The next president of Suriname became Jules Wijdenbosch, who was candidate on behalf of Bouterse's party. Desi Bouterse returned to power in 2010. When Bouterse again became the president of Suriname, he designated February 25 as the national holiday. The commemorative ceremony annually takes place at the “monument of the Revolution”, the Central Police Station, that was burned by Bouterse's soldiers.